Africa is the world's second largest and second most-populous continent (the first being Asia in both categories). At about 30.3 million km2 (11.7 million square miles) including adjacent islands, it covers 6% of Earth's total surface area and 20.4% of its total land area. With 1.2 billion people as of 2016, it accounts for about 16% of the world's human population. The continent is surrounded by the Mediterranean Sea to the north, both the Suez Canal and the Red Sea along the Sinai Peninsula to the northeast, the Indian Ocean to the southeast and the Atlantic Ocean to the west. The continent includes Madagascar and various archipelagos. It contains 54 fully recognised sovereign states (countries), nine territories and two de facto independent states with limited or no recognition. Africa's average population is the youngest amongst all the continents; the median age in 2012 was 19.7, when the worldwide median age was 30.4. Algeria is Africa's largest country by area, and Nigeria is its largest by population. Africa, particularly central Eastern Africa, is widely accepted as the place of origin of humans and the Hominidae clade (great apes), as evidenced by the discovery of the earliest hominids and their ancestors, as well as later ones that have been dated to around seven million years ago, including Sahelanthropus tchadensis, Australopithecus africanus, A. afarensis, Homo erectus, H. habilis and H. ergaster—with the earliest Homo sapiens (modern human) found in Ethiopia being dated to circa 200,000 years ago. 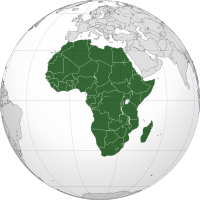 Africa straddles the equator and encompasses numerous climate areas; it is the only continent to stretch from the northern temperate to southern temperate zones. Africa hosts a large diversity of ethnicities, cultures and languages. In the late 19th century European countries colonised almost all of Africa. Africa also varies greatly with regard to environments, economics, historical ties and government systems. However, most present states in Africa originate from a process of decolonisation in the 20th century. African nations have attempted to cooperate through the establishment of the African Union, which is headquartered in Addis Ababa. Afri was a Latin name used to refer to the inhabitants of Africa, which in its widest sense referred to all lands south of the Mediterranean (Ancient Libya). This name seems to have originally referred to a native Libyan tribe; see Terence for discussion. The name is usually connected with Hebrew or Phoenician ʿafar 'dust', but a 1981 hypothesis has asserted that it stems from the Berber ifri (plural ifran) "cave", in reference to cave dwellers. The same word may be found in the name of the Banu Ifran from Algeria and Tripolitania, a Berber tribe originally from Yafran (also known as Ifrane) in northwestern Libya. Under Roman rule, Carthage became the capital of the province of Africa Proconsularis, which also included the coastal part of modern Libya. The Latin suffix -ica can sometimes be used to denote a land (e.g., in Celtica from Celtae, as used by Julius Caesar). The later Muslim kingdom of Ifriqiya, located in modern-day Tunisia, also preserved a form of the name. Africa's population has rapidly increased over the last 40 years, and consequently, it is relatively young. In some African states, more than half the population is under 25 years of age. The total number of people in Africa increased from 229 million in 1950 to 630 million in 1990. As of 2016, the population of Africa is estimated at 1.2 billion. Africa's total population surpassing other continents is fairly recent; African population surpassed Europe in the 1990s, while the Americas was overtaken sometime around the year 2000; Africa's rapid population growth is expected to overtake the only two nations currently larger than its population, at roughly the same time - India and China's 1.4 billion people each will swap ranking around the year 2022. Africans profess a wide variety of religious beliefs, and statistics on religious affiliation are difficult to come by since they are often a sensitive a topic for governments with mixed religious populations. According to the World Book Encyclopedia, Islam is the largest religion in Africa, followed by Christianity. According to Encyclopædia Britannica, 45% of the population are Christians, 40% are Muslims, and 10% follow traditional religions. A small number of Africans are Hindu, Buddhist, Confucianist, Baha'i, or Jewish. There is also a minority of people in Africa who are irreligious.